Stunning tablescape styled by The Bespoke Bride at the Belknap Hot Springs Lodge and Gardens. Photography by K. Gabrielle Photography , Florals by Revel Petals, lettering by Penned in the Pacific, specialty rentals by Curated. Looking through photos from the last season’s weddings has me inspired and excited for what this year has to come. I work with clients of all styles and personalities, planners and event designers who also cover a broad spectrum of aesthetics. Some clients have specific ideas, others don’t know where to start. We get excited to have an influence on the overall design whether we are styling the event, or just contributing that little extra bling. However the big picture evolves into those juicy details on your big day, we want you to get that giddy feeling when it all comes together. If you are still in your planning process, and still need to add those finishing details, our decor selection has been growing to cater to current and future trends. We urge you to schedule a mock-up with us. Why wouldn’t you want to play around and get your look just right? Here are some weddings and events that will be sure to have you equally inspired! An intimate boho vibe at Suttle Lake Lodge. Photography Kat Gillespe, Coordination Ella Events, Florals HART Floral, decor and vintage glassware Curated. Smokey, earthy vibes at a private event. We are in love with these grey stoneware plates and rattan chargers. Photography K. Gabrielle Photography, styling and rentals Curated. Geometric and gold accents at Black Butte Ranch. Photography Ely Roberts Photography, Florals Petals, Flowers by Katie, and decor by Curated. A far from boring decadent white color scheme on our farm tables. Our marble chargers add that touch of modern elagance. Photography Lady J Memories, styling by Swoon Event and Design, florals by The Bend Flower Company, rentals by Curated. Vintage woodland romance at Five Pines Lodge. Photo by Christy Cassano Photography, florals by Summer Robbins Flowers, planning by J29 Events, specialty rentals by Curated. Light, airy, and blush feels on the high desert. Photography K. Gabrielle Photography, florals by Summer Robbins Flowers, rentals by Curated. Edgy, natural tablescape at Spoken Moto. Photo by Benjamin Edwards, planning and styling Britt and Bixby Events, rockin’ florals by Bramble Floral, lettering by Benson Paper Co., Specialty rentals by Curated. Designed for Wedventure Magazine. An ideal arbor and decor for a colorful wedding ceremony. Photo by Lady J Memories, Florals Hey You Flowers, venue White Aspen Creative, arbor, decor and rug Curated. 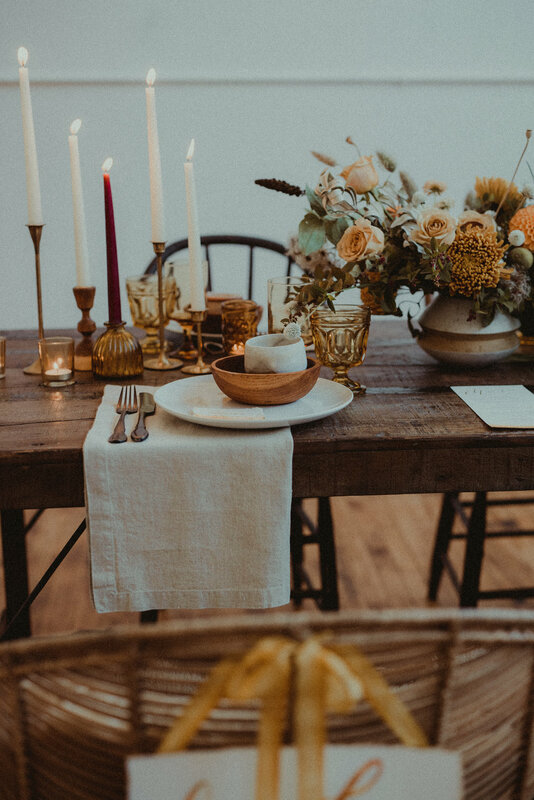 70’s inspired tablescape of dreams. Amber and neutral elements provide warmth and comfort. Photography Anna Caitlin Photography, florals Small Yard Flowers, coordination The Indigo Bride, rentals by Curated. Stunning pops of coral for a little drama. Photo Gallivan Photo, florals by Summer Robbins Flowers, styling by Swoon Event and Design, Lettering by My Fair Letters, rentals by Curated.